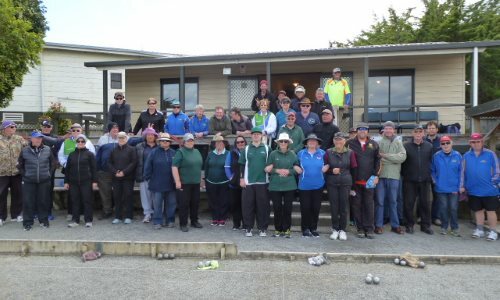 Seven clubs were represented at the Champion of Champions Singles played at the Upper Hutt Pétanque club. Alan Taylor (Kapiti) repeated his win of 2015, although this time it was on tie-break from Moises Burgos (Upper Hutt). Six Wellington region players are among the 38 taking part taking part in the National Singles Championship in Dunedin this weekend (7-8 October). Manawatu’s third Cup defence was away at Kapiti. Unfortunately, things didn’t start well as they lost all three first round games. In the second round, Kapiti again won all three games to reclaim the Trophy. In the third round, Manawatu won the Doubles game. The final score was Manawatu 1, Kapiti 8. Kapiti’s first defence is at home to Masterton. Fifteen players will take part in the WPA Regional Shooting Competition at the Kapiti Petanque club this weekend. Twenty-one teams are taking part in the WPA Regional Doubles Championship at the Kapiti Petanque club this weekend (14-15 October). Twenty-one teams took part in the Regional Doubles Championship at Kapiti, which was three less than last year. The usual five round Snake (random draw) format was played on Saturday. Three teams, Myles Cowper/Michael Rocks, Steve Frampton/Ann Hogg and Christine Strichen/Claire Wilson, went through undefeated. Sunday saw the top eight teams battle it out for the Trophy, the next eight for the Plate and the remaining teams faced off in the Bowl. Myles and Michael maintained their unbeaten record in the morning round. Steve and Ann lost one game and were the third team on points differential in their pool when three of the four teams finished with two wins. Christine and Claire lost two games to drop down to the Trophy Consolation. The Trophy final featured Myles and Michael against Moises Burgos and Brian Smith. A see-saw battle saw Moises and Brian take a 4-0 lead, only for Myles and Michael to come back at 5-4. Moises and Brian went to 7-5, before a unfortunate ricochet saw them drop 4 points to go behind 7-9. The next end saw Myles and Michael pick up another 4 to win the match 13-7. The Trophy Consolation final was won by Steve Frampton/Ann Hogg 13-9 over Christine Strichen/Claire Wilson. The Plate final was won by Dave Gatchell/Pete Hamilton 13-8 against Brett Maguire/Tony Simpson. Brian Frampton/Shirley MacDonald won the Plate Consolation 13-10 against Yvonne Futcher/Alan Taylor. The Bowl was won by Barbara Nicholls/Trish Smart.